Sometimes a little bit of everything, and sometimes well….. NOTHING! Having been a member of the America On Wheels Museum detailing team for five years, I have seen first hand what goes into preparing vehicles for museum display. The America On Wheels Museum has a number of cars, trucks, motorcycles and even bicycles that are permanent residents, but there is also the rotating exhibit which changes every six months. All of these vehicles are closely monitored by both the museum staff and detail team during their stay and every effort is made to make sure that they are floor-ready every day. Each vehicle undergoes a careful inspection upon arrival. Many of the vehicles arrive in good condition and only need minor cleaning before heading to the museum floor. Others may arrive in poor condition after sitting in the elements or are daily drivers that are in need of a good cleanup. We also occasionally receive vehicles that we are specifically instructed NOT to clean in order to preserve the exact current condition that the vehicle has been presented in. Often these are vehicles of some historical significance or are barn finds that hold more appeal when left in their original condition. Once the vehicles have been properly cleaned and prepped, we maintain their appearance on regularly scheduled detailing days and on an as-needed basis during museum hours. The vehicles that are on long-term loan or that have been donated to the museum often have fuel and vital fluids removed so that the internal components are not damaged by chemicals in the fuels and oils. Vehicles that are in the changing exhibit usually retain fuel and fluids as they are only on short term loan and occasionally the owner will remove the car for their personal use . We always use clean, tagless microfiber towels and 303 Speed Detailer for removal of dust and fingerprints. We use separate microfiber towels for painted surfaces and for glass so that there is no cross-contamination of cleaning products. Only cleaning products specifically designed for automotive use can be used. No “general purpose” cleaners or lubricants. Use only water-based tire treatments when prepping vehicles. Most importantly, the museum occasionally receives specific instructions from the vehicle owners as to how much or how little care a vehicle should get. Some do not want waxes or cleaning products applied at all but prefer to simply dust off their vehicles. Some want a full detail when the vehicle arrives. 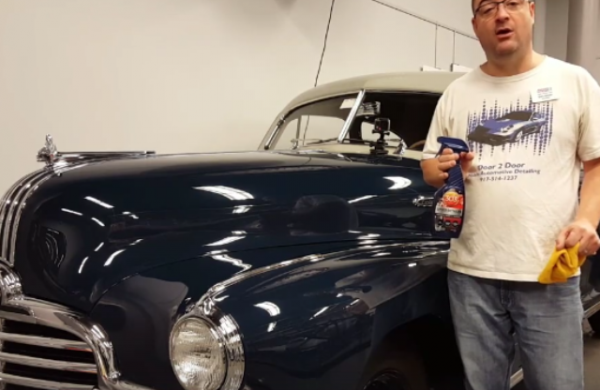 So the next time you are touring your favorite automotive museum, know that there is an entire team of detailers working behind the scenes to keep your favorite historic cars looking their best! Find out the best way to store your car or protect and preserve it during storage and visit the America on Wheels Museum.